It is easy in this day and age to get pessimistic – caught up in the dissociative nature of foreign actions, policies and global occurrences. The big picture often seems too, well, big. The influx of information between the murder of a journalist in the Saudi consulate to the ever-compiling effects of climate change all around us becomes daunting. There are so many issues with the world, and anyone with a bleeding heart, or even just a heart, can easily be overwhelmed. “The problems are too big to make a difference,” we might tell ourselves. Over saturated with issues to address, it is easy to become spread too thin, burn out, and become increasingly discouraged. I am not insusceptible to such a way of thinking. I have spent many a day and night, staring blankly in some obscure direction, contemplating how I could make a difference. The weight just compiles and no matter what the direction, it comes down to “what could I do?” I could uproot my life and go fight poachers in Africa; I could commit myself to a life destined to end in martyrdom for some cause; or maybe I could tuck myself away from it all in some tiny house far beyond the reach of any – none of which are rational solutions for a pragmatic life. It has been done by others, and some have made it work. To solely bear such a burden takes a toll. That is exactly why you shouldn’t do it alone. Rene Dubos recognized this very same mentality years ago on a college tour through the United States and Canada. Students and teachers were preoccupied with problems on a grand scale, looking at global problems but neglecting those that they could actually impact. He coined the phrase “Think globally, act locally,” a mentality that seems to be gaining momentum throughout the United States. “Contribute to the welfare of humankind and our planet,” he said. “The best place to start is in your own community and its fields, rivers, marshes, coastlines, roads, and streets, as well as with its social problems.” (Riverkeepers p.55.) Words that resonate with the very tone of progress and change. Dan D’Apice, a 24 year old Navy veteran studying Parks and Conservation Management at Paul Smith’s College, embodied those very concepts to make an impact. It all started out with an assignment in his class with Bethany Garretson, an infectious proponent of change. It was then that he decided to support a cause that hits close to home for him and his fellow veterans on campus. Dan decided to get ahold of Mission 22. “United in the war against veteran suicide” is their slogan. Their mission is to prevent veteran suicide by getting veterans the help they need it. Eighty-five percent of all their proceeds go directly to Mission 22 programs, as opposed to the more infamous Wounded Warrior Project, which spends 60 percent of their proceeds on veterans (CBS News 2016.) Warrior Integration Now, or WIN, is the program Mission 22 operates in partnership with Full Spectrum Health. “The goal is to eliminate the symptoms of trauma by addressing the underlying physiological and psychological imbalances. By the end of this twelve-month program you will feel calmer in your body and mind, and more connected to those around you.” That’s taken directly from their website, mission22.com. 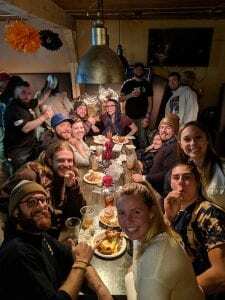 A mission statement that, as a combat veteran, I can directly attest to the necessity and value of community connection. Community connection. That is what made Dan’s program and efforts stand out. Dan started out simply completing an assignment, but as he began laying the framework for the event, he realized he had the makings of something more. Throughout the Adirondack community, the more people he spoke with, the more support he had, and the larger the event grew. 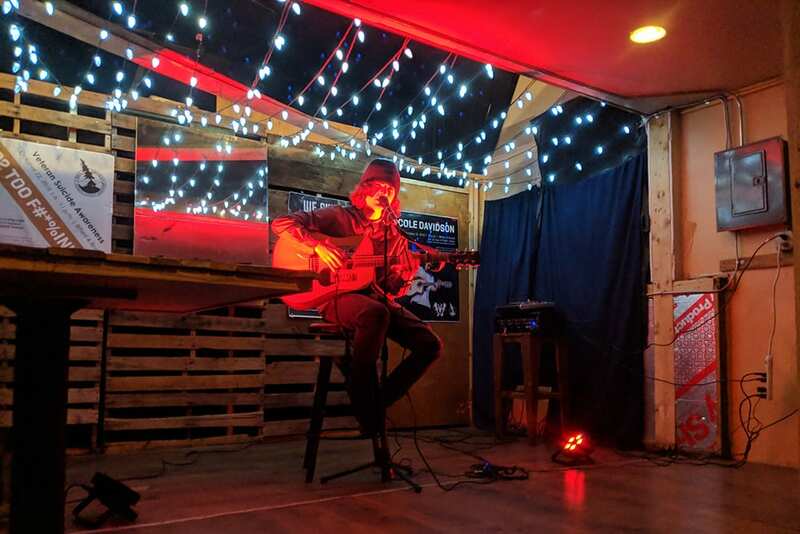 He began by coordinating with some of the owners of Bitters and Bones in Saranac Lake to facilitate a wing night fundraiser and they volunteered a free venue. For just $20, you would get a ticket that got you 10 hearty wings and a craft beer or soda. Most of the wings were donated by Bitters and Bones, the beer was donated by Raquette River Brewing Company and Paul Tatro. It didn’t stop there, though. It was just beginning. Tickets were being sold on campus by Dan and the Student Veterans Association of Paul Smith’s College. 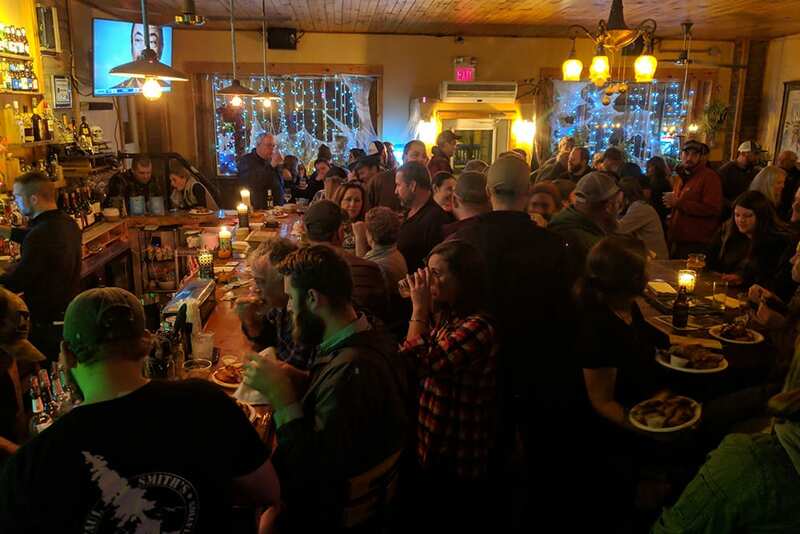 The event was also being advertised by Bitters and Bones, The Shamrock Bar & Grill, and various other supporting businesses. Dan also personally went around the community to see what other local businesses were willing to contribute. With the support and generosity of the local community, Dan had procured the means to make this fundraiser happen. 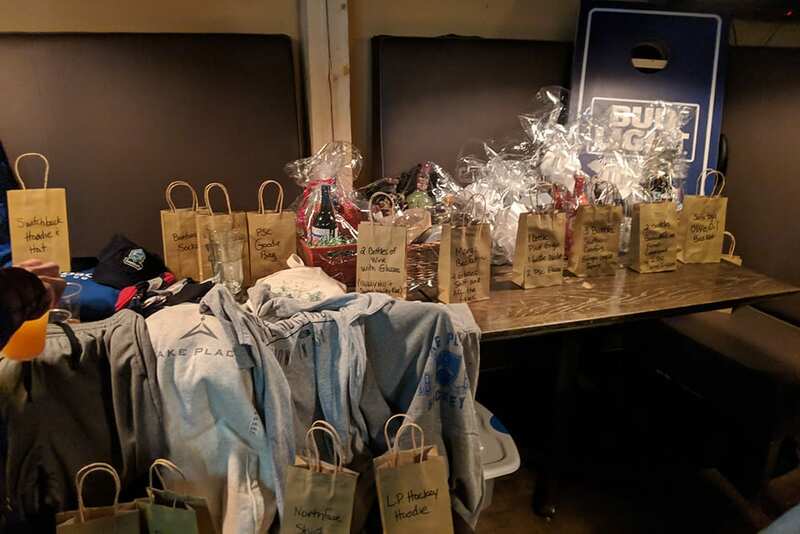 All said and done, with ample hard work, Dan coordinated a wing night benefit with live music by Cole Davidson, paid for by Mina Clark, and a Chinese auction as well as a 50/50 raffle to raise additional funding. The result, a staggering $6,011 dollars raised. Nearly 200 people attended the event. The atmosphere was percolating with a light-heartedness and good vibes. 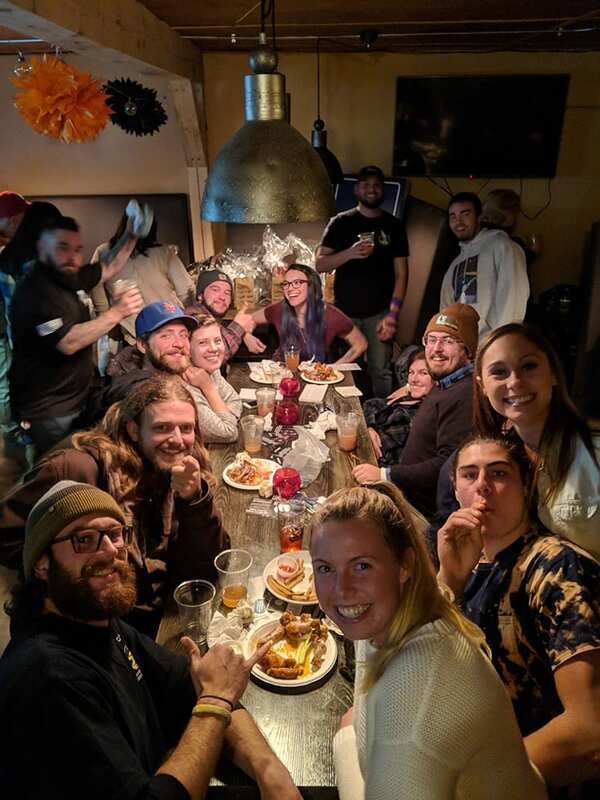 It was a culmination of great food, awesome drinks, chill music, and most of all, one community coming together to support a good cause. The scene was wild; young and old alike, bearded and clean shaven, grizzled and green, motorcyclists and liberal snowflakes, Republican and Democrat, blue collar workers and college students (sometimes one in the same), all under one roof to support our nations fighting force in their own personal fight… a fight that no longer seemed so isolating. The people that showed up were simply Americans. They were together in a unification that almost seems extinct, a rarity if you will, all thanks to one man and a school project. The generosity of everyone there was unheard of, or so one might think. People paid $5 for $2 beers just to donate the rest. People were tipping between $1 and $100 all to the cause. The man who won the 50/50 raffle, without so much as a second thought, turned around and donated every penny of the winnings back to the cause. This is the expression of decency and care that seems so far gone in our world today, but is it really? As a society, we are exposed to a lot of negativity through various media outlets. The news, Facebook, Instagram, Twitter, they are filled with tragedy violence. These are the things that we are more prone to be interested in, respond to, or react to, on the very basis of our human biology. We are after all, only self-conscious animals. Violence and aggression are derivative of our origins, and survival mechanisms have us responding to such stimuli with alertness via chemical cocktails of dopamine and adrenaline. That makes is easy to infer why there is such a concentration of violence in all forms of media outlets; violence gets ratings. It becomes very easy to fall into a trend of negativity with such high exposure to these stimuli. The world though, is in fact, not as ominous as is seems. This overexposure creates a skewed perception of the way we view our world. However, when looking at things on a statistical basis, the world is arguably the best it has ever been. The historical trajectory of violence is in fact a decline, not an incline. We are living in the most peaceable era this planet has ever experienced. Better Angels of our Nature, a book by Steven Pinker, explores the reality of our world and how great it really is. Less poverty, less violence, less hunger, less disease. The human race, the animals that we are, are inherently on a path for good. Events like the one orchestrated by Dan D’Apice occur all over the world, every day. We just tend not to hear about them as much. No one has ever rallied a following by telling a crowd how great everything is. The catalyst for change is out there though, in each of us. It is in our hands to “be the change we want to see in the world.” All we have to do is pursue it.